1. M.J. Yelland, C.J. Nikles, N. McNairn, C.B. Delmar, P.J. Schulter, R.M. Brown, A series of Rheumatology, 2004, 46:135. 4. P. Verhaeghe, N. Azas, M. Gasquent, S. Hutter, C. Ducros, M. Laget, S. Rault, P. Rathelot, P. Vanelle, Bioorg. Med. Chem. Lett., 2008, 18:396. 6. F.C. Hans, E. Jawetz, B. G (Ed) Appleton Lange, 1998, 4, 761. 7. J. Kumes, J. Bazant, M. Pour, K. Waisser, M. Slosarek, J. Janota, Farma co, 55 (2000) 725 – 729. 8. D.W. Hopper, M.D. Vera, J. Sabatini, J.S. Xiang, M. Ipeg, Bioorg. Med. Chem. Lett., 2009, 19:2487. 9. J. De Ruiter, R.F. Borne, C.A. Mayfield, J. Med. Chem., 1989, 32:145. 10. U.J. Doxepine, Elsevier, 2006, 81-84. 11. K.A. Jones, M. Hatori , L.S. Mure, J.R. Bramley, R. Artymyshyn , S.P. Hong , M. Marzabadi , H. Zhong , J. Sprouse, Q. Zhu, A.T. Hartwick, , P.J. Sollars, G.E. Pickard , S.Panda , Nat. Chem. Biol., 2013, 9, 630. 12. R.D. Tung, M.A. Murcko, G.R. 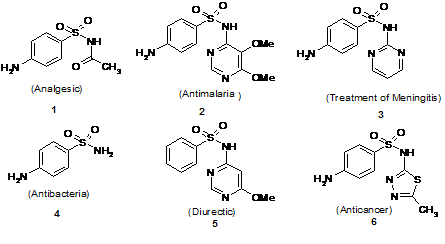 Bhisetti, Sulphonamides inhibitors of HIV-Asparty Protease (2007) EP0659181, US 5585397. 13. O. Skold, Sulphonamide resistance: mechanisms and trends, Drug resistance updates, 2000, 3, 155. 14. O. Skold, Resistance to trimethoprim and sulphonamides, Veterinary research, 2001, 32:261. 15. G.A. Khodarahmi, C.S. Chen, G.H. Hakimelahi, C.T. Tseng, J. W. Chen., J. Iranian Chemistry Society., 2005, 2, 124. 16. U.R. Aziz, T. Wajecha, A.A. Muhammed, A. Sumbal, M.K. Khalid, A. Muhammed, A. Hukhar, Int. J. Chem. Res., 2011, 3, 99. 17. D. Steinhilber, Curr. Med. Chem., 1999, 6, 71. 18. R.S. Vardanyan, V.J. Hruby, Elsevier, 2006, 21, 277. 19. L. Beregi, P. Hugon, Sythesis of Essential Drugs, 1971, 3, 565. 20. S.S. Rindhe, B.K. Karale, R. Gupta, M.A. 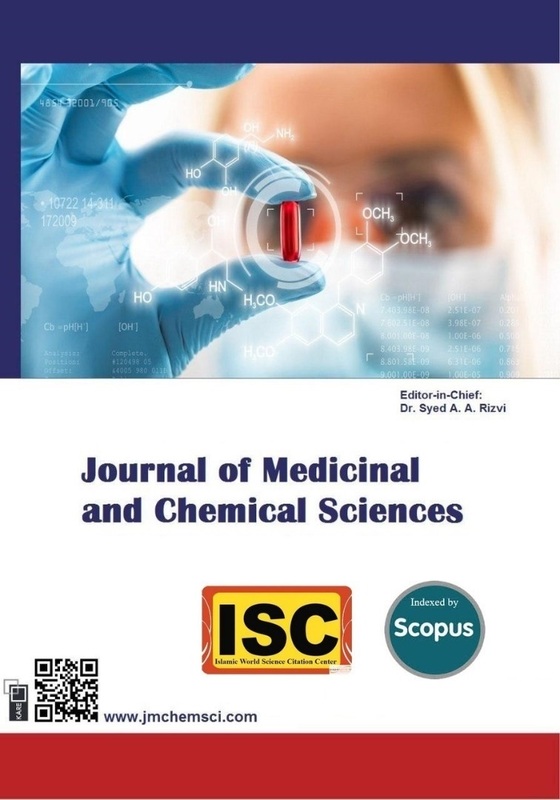 Rode, Indian J. Pharm Sci., 2011, 73, 292. 21. S.M. Sondhi, R. Rani, O.P. Gupta, S.K. Agrawal, A.K. Sexena, Mol. Divers., 2009, 13, 357. 22. N.A. Nassir, Y.A. Mohammed, A. Zanariah, Molecules, 2013, 18, 11978. 23. B.P. Navin, N.P. Virendra, R.P. Hemant, M.F. Shaikh, J.C. Patel, Acta Pol. Pharm., 2010, 3, 267. 24. Z. Chen, W. Xu, K. Lu, S. Yang, H. Fan, P. S. Bhadurg, D. Hu, Y. Zhang, Molecule 2010, 15, 9046. 25. D.I. Ugwu, U.C. Okoro, P.O. Ukoha, S. Okafor, A. Ibezim, N.M. Kumar, Eur. J. Med. Chem., 2017, 135, 349. 26. S. Ali, A.J. Qasir, K.Y. Saor, Iraqi J. Mark. Rec. Cons. Protection., 2009, 1, 1. 29. S.D. Barrett, A.J. Bridges, C.M. Flamme, M. Kaufam, A.M. Doherty, R.M. Kennedy, D. Marston, W.A. Howard, Y. Smith, J. S. Warmus, H. Tecle, D.T. Dudley, A.R. Saltiel, J.H. Fergus, A. M. Delaney, S. Lepage, W.R. Leopold, S.A. Przybranowski, J. Sebolt-Leopold, K. Van Becelaere, Bioorg. Med. Chem. Lett., 2008, 18, 6501. 31. N. O’Boyle, M. Banck, C.A. James, C. Morley, T. Vandermeersch, G.R. Hutchchison, J. Chemoinformatics., 2011, 3:33. doi: 10.1186/1758-2946-3-33. 32. S.P. Dilber, Z.S. Žižak, T.P. Stojković, Z.D. Juranić, B.J. Drakulić, I.O. Juranić, Int. J. Mol. Sci., 2007, 8:214. 34. G.M. Morris, D.S. Goodsell, R.S. Halliday,R. Huey, W.E. Hart, R.K. Belew, A.J. Olson, J. Comput Chem., 1998, 19, 1639.